I saw the photos on Kokken 69's blog and I wanted to duplicate them. They look so pretty. Then I recalled I have made profiteroles before using June's recipe. 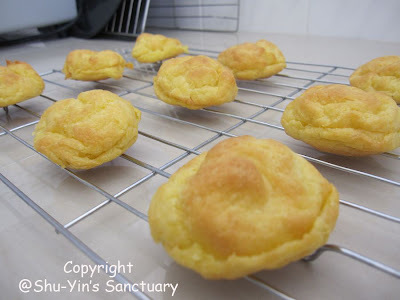 I also remembered June's choux puff pastry recipe was easy, so I decided to be lazy and just used back June's recipe rather than trying out a new recipe. Furthermore I had very little time left. This time, the choux puff pastry gave me some problems. Somehow the pastry dough was wetter than the last time I remembered. I think the eggs used were too large size or something. But somehow they were wetter and stickier and more difficult to manage. And when they were out from the oven, the insides were still soft and wet and I popped them back into the oven. Due to the longer oven time, they came out crispier than I would have liked them. Sigh. But the colour was still very nice. Golden brown. 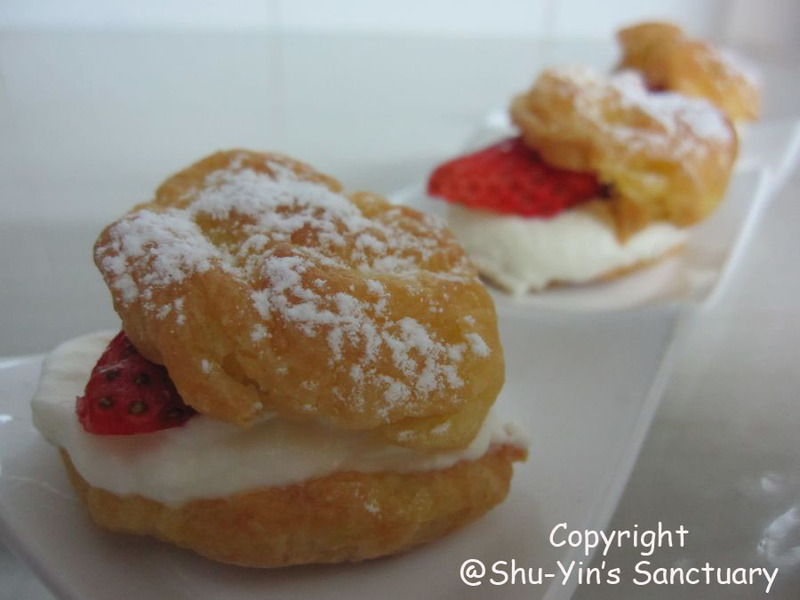 This time instead of making the corn custard, I made the cream filling, using June's recipe as well. I did not have heavy cream so I subbed it using whipping cream. I know they are different but I just tried to make do. It turned out alright after whipping them for quite awhile. Then I took out the Korean strawberries (the only sweet strawberries I've ever tasted!) 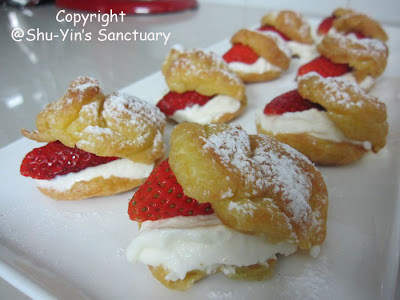 and cut them into halves to be topped on top of the cream before sandwiching them together with the choux puff pastry. Popped them into a tupperware to be brought to mum's house for them to try. Preheat oven to 400F (~200 degree C). Line baking sheet with parchment paper. Sift flour and salt into a bowl. Heat (medium heat) butter and water in a pan until butter melts. Increase heat and bring mixture to a boil. Remove pan from heat and immediately tip in all the flour. Beat vigorously with a wooden spoon until flour is mixed into the liquid. Return pan to a low heat, then beat mixture until it leaves the sides of the pan and forms a ball. Set pan aside and allow to cool for 2-3 minutes. Add beaten eggs, a little at a time, beating well after each addition until you get a smooth, shiny paste which is thick enough to hold its shape. Spoon or pipe choux pastry into rough balls (slightly larger than a golf ball) onto baking sheet. Sprinkle baking sheet with some water. Bake pastry for about 30 minutes, until pastry are well risen (about twice the size) and golden brown. Remove from oven, and make a neat horizontal slit along the sides of each pastry to release steam. Lower oven temperature to 350F (~180 de and bake for another 5-10 minutes. Cool on a wire rack. To make cream filling, see recipe below. To assemble, enlarge original horizontal slits and cut pastry into halves. Fill cream filling. 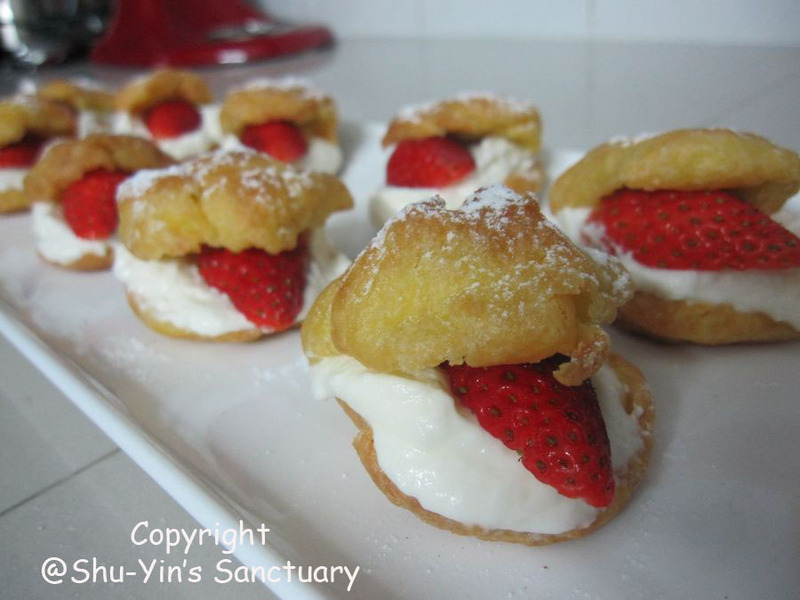 Top with strawberry halves (optional). Dust with some powdered sugar optional) before serving. With a hand mixer, whip heavy cream with icing sugar and vanilla extract until cream holds its shape. Spoon whipped cream into a piping bag fitted with 1/2 inch plain nozzle. Squeeze filling into profiteroles and stop when cream starts protruding from where the nozzle is inserted into the profiteroles. 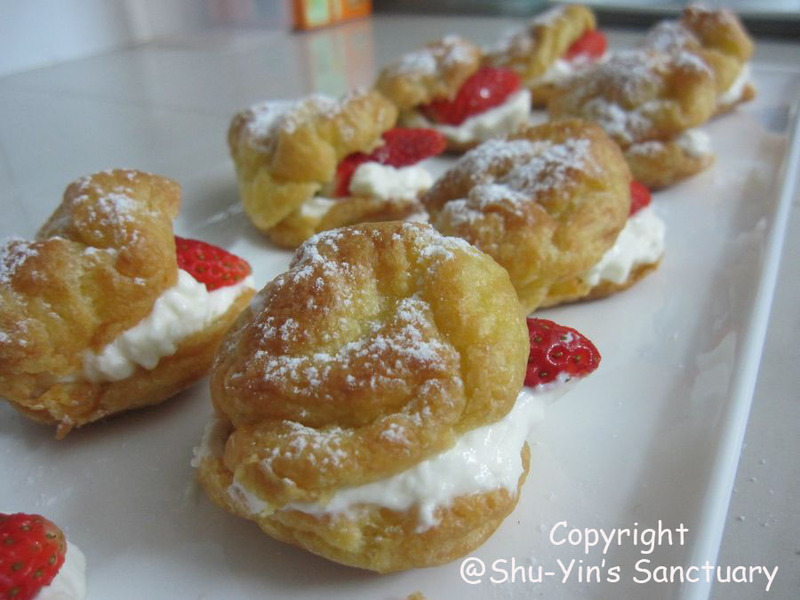 You should have more than enough whipped cream for the profiteroles. 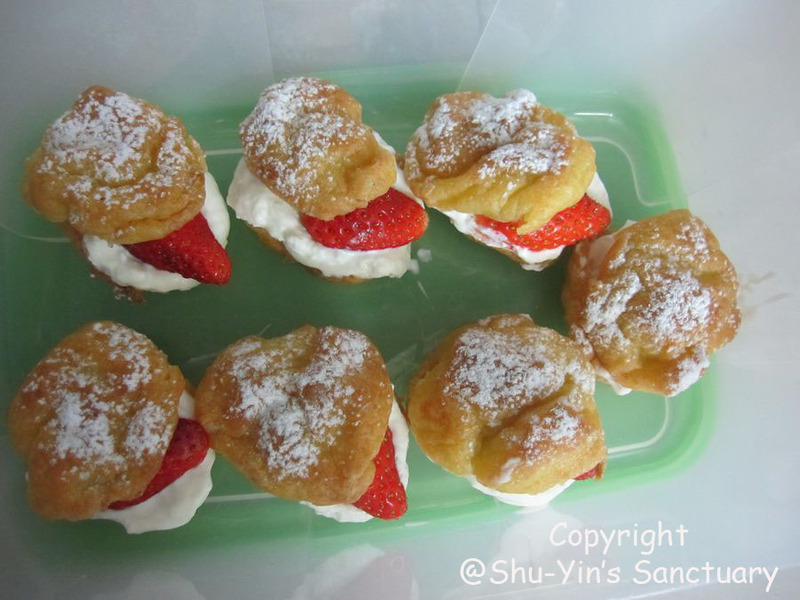 Here are 2 optional decorations that you could do to up-sell your profiteroles even more. Once the profiteroles have been filled, dust (with a sieve) them with the powdered sugar. I tasted my first Korean Strawberries lately and I do agree they are very nice. The fragrance is somehow different from American and local ones. I've even tried Egyptian ones before but they smell like usual lor. Korean ones are truly special. My girls refuse to wash hands after eating them, hahah! yes, korean strawberries is the only sweet strawberries ive tasted so far, so im a fan of them!